The most common form of a business presence in Latvia is a limited liability company [SIA]. The minimum share capital required to establish a limited liability company is 2800 EUR or, if a micro company, less than 2800 EUR, namely, from 1 - 2800 EUR which shall be paid before a company registration with the Commercial register when the company bank account is opened. Limited Liability Company [SIA] may be founded by a natural person, as well as by a legal person (company). Establisher/shareholder is a natural person (max 5). The same person (s) in board. State fee for registering SIA (limited liability company) if established by 2 or more persons – 142.29 EUR; or 426.87 EUR to review documents within 1 day and publication fee in official Journal is 27.03 EUR. For company that is established by 1 establisher –registration in 1-3 days is –142.29 EUR; publication fee in official Journal is 27.03 EUR .State fee for micro company is 21.34 EUR or 64.02 EUR to review documents of company within 1 day, publication in official Journal is 14.23 EUR. State fee does not include notary fees that may vary from 26 to 100 EUR. 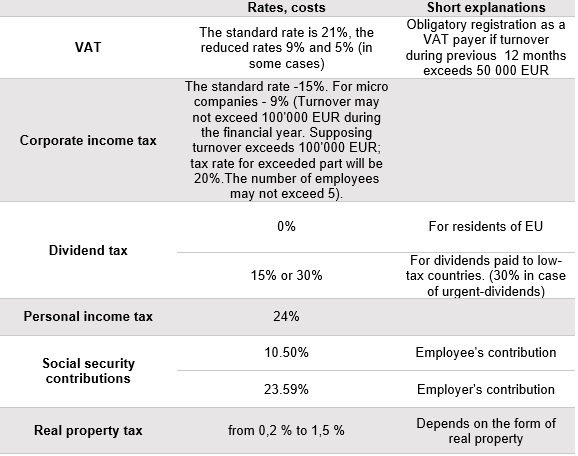 There is no state fee for registering as VAT payers in Latvia. In order to open a company's bank account the cost varies slightly depending upon the particular bank. In the case of a company being incorporated by a legal person (company) there might be additional costs for translation services (approx 14 EUR/page). The registration takes 1 to 3 business days from the submission of documents to local authorities and the all-included state fee range is from 220 EUR to 490 EUR. Please do note that it is necessary to indicate the legal address of the company. Therefore, the registration at particular premises in Latvia is necessary as the initial step. For your convenience we may offer to use our firm’s legal address in Riga. The company is deemed to have been established upon registration thereof with the Register of Enterprises. All the documents must be submitted to the Register of Enterprises in Latvian language. Approximate cost for one page translation is 20-25 EUR/page; approximate cost for the translation of Company setup documents is 290EUR. Certificate from the bank which proves that the initial share capital has been paid (if a micro company – the establisher approves payment by himself). Also please be informed that the availability of the name of the legal entity must be checked prior to registration. A foreign merchant has the right to open a representative office in Latvia. A representative office is not a legal person, and it does not have a right to conduct commercial activities in Latvia. legal address, name and basic business activities of the foreign merchant. State fee -28.46 EUR (registration in 3 business days), 85,38 EUR (in 1 business day) and fee of publication in official Journal 18.50 EUR.